If you ever have used or plan to use the "Compare to CAD Structure" tool found under a wt-parts Structure Tab: this is for you. Please read and think about how the current functionality of this tool affects you. The reason for this is that you are not looking at the CAD-structure specified in the window above but a calculation of it based on the wt-part structure and the owner-links in it. Sometimes the Creo CAD parts in our Creo assemblies are not the "original" valid for production, merely a "rough" approximation of its geometry to have as a representation in the Creo assembly. All Product Ideas should end with an idea, so here is mine: Make the Compare Tool actually compare the objects it says it compares. Please vote up. Your screen shot is the normal behaviour. As it will show the "owner" CAD. After having spent over an hour on the phone with a PTC Product Manager regarding this yesterday, I know that this is "normal behavior" and "working according to spec", and it may be so. But in my opinion the tools function is incorrectly presented to the user: if the Creo built assembly structure isn't taken into consideration in the "comparison", why mention it at all and why call it a comparison tool? 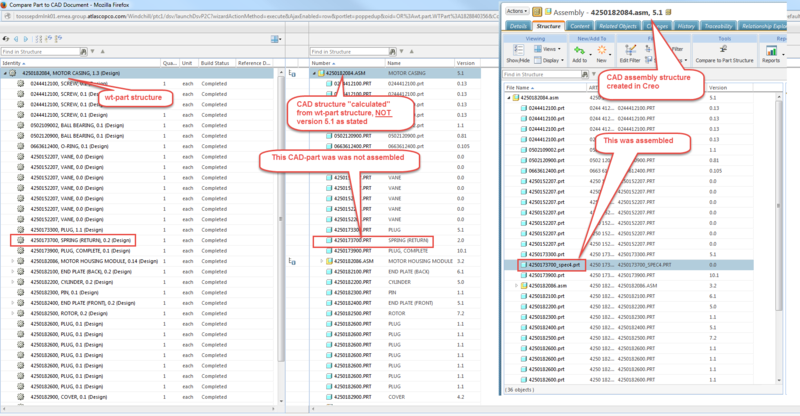 If the tool is called "Compare to CAD structure" and it even displays the linked assembly version as the one being compared it should do just that and nothing else. Wouldn't you agree that this would make the system more user friendly?